NYC, 02/20/2019, 2:00PM. 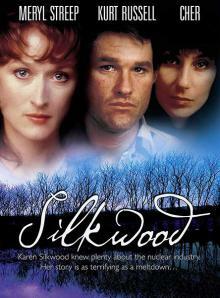 Silkwood (1983): Five time Oscar nominated drama with Meryl Streep, Kurt Russell and Cher. 131 min. Director: Mike Nichols. The film received positive reviews and was a box office success, with particular attention focused on the performances by the three leads. At the 56th Academy Awards, Silkwood received five nominations in total, including Streep for Best Actress, Cher for Best Supporting Actress, Nichols for Best Director. The screenplay by Nora Ephron and Alice Arlen was inspired by the life of Karen Silkwood. Silkwood was a nuclear whistleblower and a labor union activist who died in a car collision while investigating alleged wrongdoing at the Kerr-McGee plutonium plant where she worked. In real life, her death gave rise to a 1979 lawsuit, Silkwood v. Kerr-McGee, led by attorney Gerry Spence. The jury rendered its verdict of $10 million in damages to be paid to the Silkwood estate (her children), the largest amount in damages ever awarded for that kind of case at the time. The Silkwood estate eventually settled for $1.3 million.